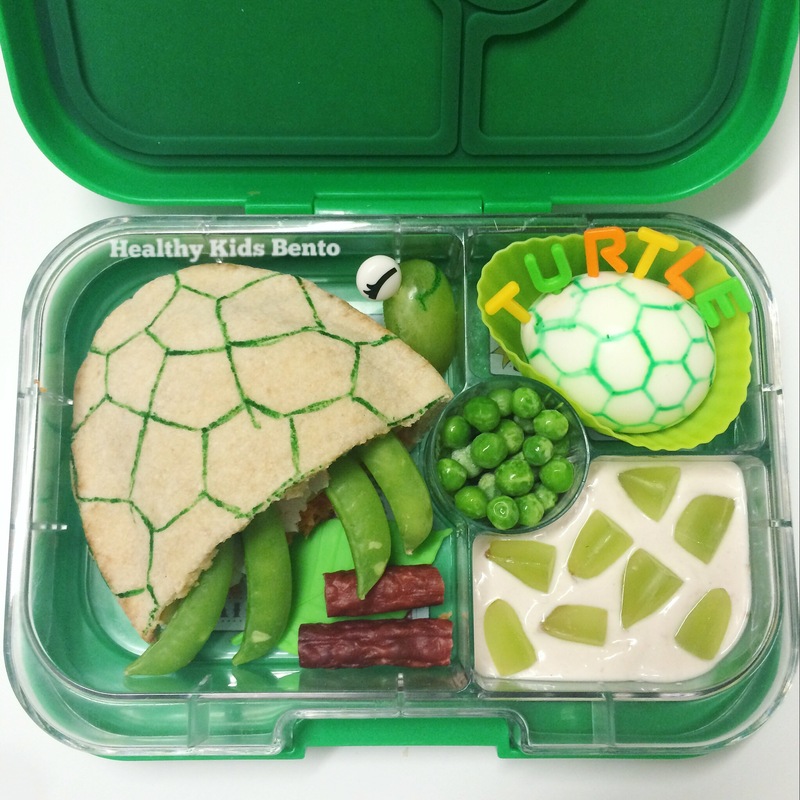 Today’s Turtle lunch for my Prep Boy is packed in the Yumbox Panino. 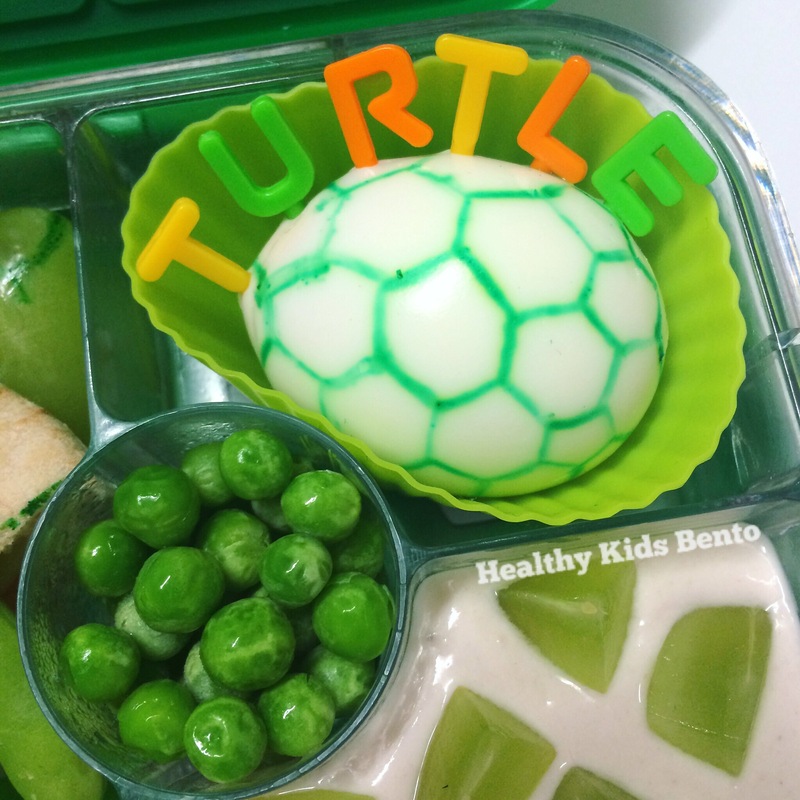 A lot of our boxes and lunches are green and there’s a good reason for it, it’s my sons favorite colour! If you have any experience with children with Autism you would know exactly how fanatical they can be about things. For us it’s everything being his favorite colour or character (Thomas) among a million other things but this one is easy for me to accommodate. 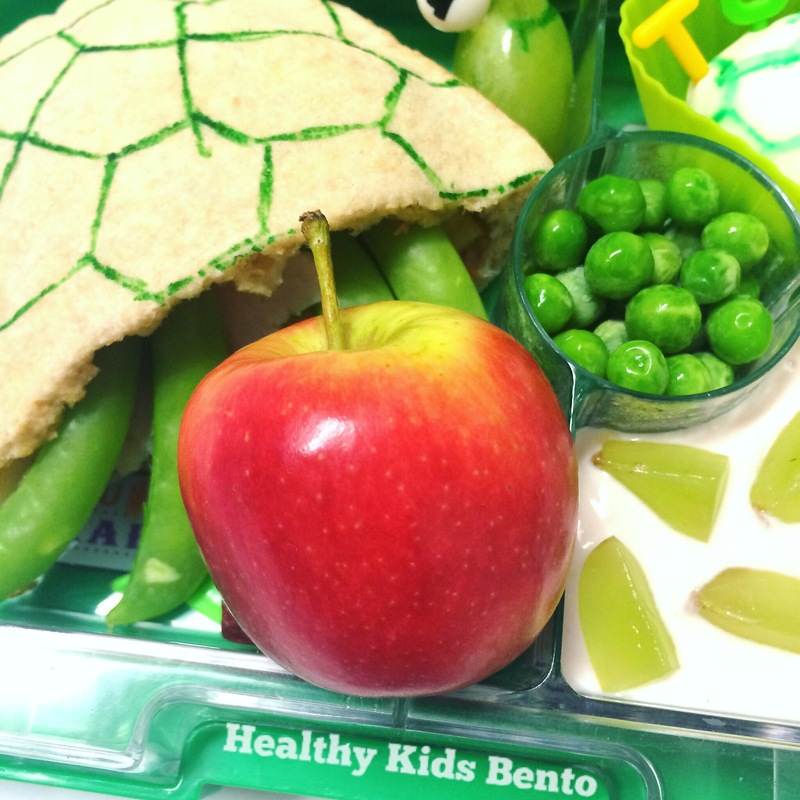 Luckily most lunchboxes come in green and so much healthy food is green! Broccoli and peas are two of his favorite foods. Anyway I just thought some of you might be wondering why everything is always so green 😊 back to the lunch! For this half of his lunch he has blueberry, banana and apple yoghurt with grapes on top, peas and a boiled egg with foodoodler shell and alpha picks. 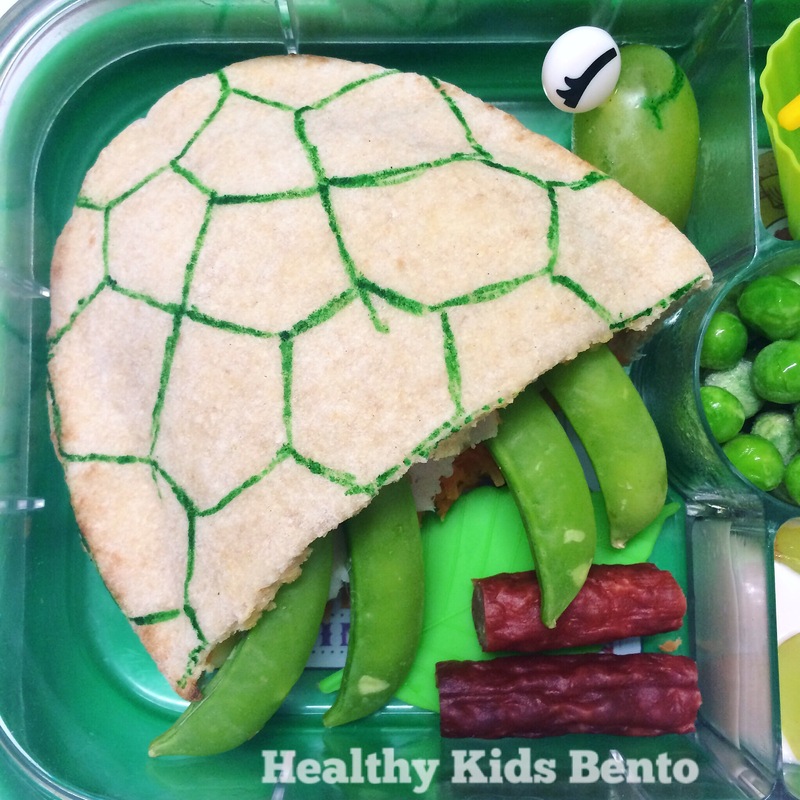 The main part of lunch: a pita pocket turtle shell drawn on with foodoodler pen filled with roast chicken, grated carrot and cheese, sugar snap pea legs, grape head with eye pick and salami stick. And finished off with an adorable tiny apple for fruit break. This lunch didn’t take very long to make, less than 15 mins. For those people who continually ask “Who has time for that?” I DO! I make the time, it really is only a little extra when you consider it still takes time to make lunch anyway and I don’t get to be with my son at school so this is a way of sending something that he will be excited for, gets him eating healthy food easily because it’s fun, he doesn’t get jealous of the kids with fun packet food anymore because his lunch is much more fun to him now. I make these lunches at night after the kids are in bed and I LOVE IT! I can’t tell you how much I enjoy making my kids lunch but you can see by the effort I put in it really does bring me joy knowing that smile he has when he sees his lunch. Don’t let anyone make you feel less or like you are trying to outdo anyone if you put extra effort into your kids lunches, and if you don’t make lunches like this don’t feel attacked when people do! We are all just trying to get our kids to be healthy and doing what we do. For this artist mama I don’t get time to paint or draw or create like I did before kids so this is me getting out some creativity while my kids reap the benefits of that. Making lunches is no longer a monotonous thing for me and I think that is awesome considering how many lunches we will make for our kids in their schooling years! Come on mamas we need to support and encourage each other, not question why someone does something a certain way. It may not be the norm for you but it’s the norm for me and if I can inspire even just one other person to get their kids eating healthier, that is winning. Support and love to you all whether you make bento lunches or not, you are doing a great job!